Apple brought modern tablets to market in 2010. Google build on that with extraordinary growth of Android based devices. Now magazine and newspaper publishers can capitalize on their work with a use of Publishing Magazines. 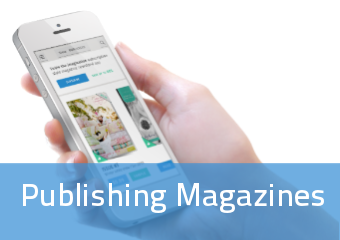 Why Publishers should use Publishing Magazines? Within couple of months of Apple releasing the original iPad publishers realize that tablets are not a threat to them. Quite the opposite – they saw this new category of devices as a way to reach more markets, more target groups and therefore sell more. One thing that was missing in 2010 is now also solved: software. Whole new category of Publishing Magazines were developed to help publishers focus on their job better. When you do the math and recap all of the costs, moving magazine mobile can end up very expensive. There all those costs that normally don't occur when you thing about magazine or a newspaper: hiring IT guys, setting up an infrastructure, managing software developers, designing for mobile, UX and UI testing, and so on. Publishers choose Publishing Magazines to reduce all this cost, but more importantly to focus on what they do best – creating great and original content for their readers. How Publishing Magazines can help you grow? Every magazine publisher wants to grow. This is particularly hard in todays economy and with a limited resources. Fortunately there is an easy way to significantly enlarge markets that your company address – and this is mobile. While going mobile may sound tough it really isn't with a help of Publishing Magazines. Publishers can test mobile markets spending very little money comparing to building custom solution. Therefore reach new people and grow! When time is money (always?) Publishers turn their attention to companies like PressPad. What PressPad does is create a hustle–free environment where Magazine owners simply upload a PDF file, click "publish" and can focus on marketing their app. No IT consulting, months of application development and extraordinary costs – PressPad is a simple online tool that exactly the same.